Editor’s note: Figuring out your buyers remains an ongoing challenge. That’s why we thought it was time for a good reminder to spur fresh thinking by bringing back this piece on the true buyer’s journey. Wouldn’t it be great if your prospects followed your neatly designed sales funnel or smartly outlined path to purchase? But honestly, you know they don’t (even if your content marketing strategy assumes they do). More than 70% of buyers conduct over half their research online before making an offline purchase, according to research from Forrester that Anna shared. McKinsey & Company research confirms the messy journey, which it dubs the consumer-decision journey. Given (1) you don’t know when the consumer starts the journey, (2) the consumer rarely follows a neat path, and (3) the consumer who eventually buys usually learned of his or her brand choice early on, what’s a content marketer to do? 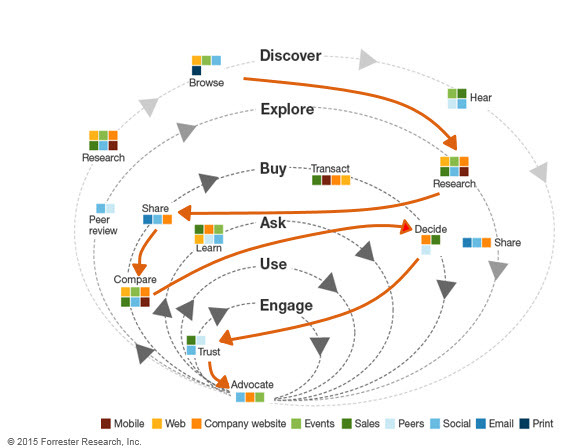 Give up on the buyer-journey model? Definitely not. 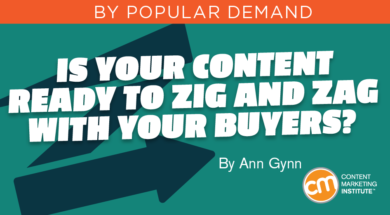 While your buyers take a chaotic journey, Anna says, you still need content to satisfy your buyers in each of the traditional sales stages. It’s the foundation on which to build your editorial plan – to detail the topics and formats that will help your buyers the most. OK, so we agree it’s critical to align your content and your distribution with the messy buyer’s journey. But how do you deliver content that truly helps your buyers navigate their twists and turns? And how do you ensure that they can access that content when they want it? Though the buyer’s journey is nonlinear, you can conquer it by creating content for the traditional stages in unexpected ways to create a content mix that gives buyers what they need even when you don’t know they need it. How do you create a good mix? Deliver for the chaotic – mixing your content formats and making them accessible no matter when or how the buyer arrives at that stage in the traditional buyer’s journey. For this post, I use a buyer’s-journey model shared in Optimize Content Marketing by Facilitating the Buyer’s Journey, and add a fourth stage – retention/loyalty. Let’s consider how to use a mix of content types that delivers at each step of the journey. The key is creating content within that format that’s the most relevant for the stage. A Demand Metric survey reveals that 97% of participants say interactive content was somewhat or very effective in educating buyers, while only 70% say the same for static content. Research also shows that interactive content’s ability to convert buyers is almost double static content’s ability. Interactive content, as Anna explains, allows for self-exploration. CMI’s 2019 research shows that over half of B2B marketers (54%) say white papers are most effective in the middle stages. Thirty-four percent say they’re most effective in the early stage and 14% say they’re most effective in the late stages. Almost half (49%) of B2B marketers successfully use in-person events and they’re almost evenly split among the three stages on which stage they’re most effective in. We know you use a lot of other content types. Here’s a quick rundown of a few of them to give you an idea of how to incorporate them in the buyer’s journey. The key to finding and delivering the right content at the right time is to stop thinking of your buyers walking a straight path to purchase. Instead, consider what type of information your potential buyers and customers need at every stage and create stage-specific content in a mix of formats. Then make it accessible when and where your buyer is ready to consume it. See how CMI uses its newsletter to support your content marketing journey. Subscribe today to the free weekday version.